In The Internet of Things That Used To Work Better I whined about rebooting my stove. 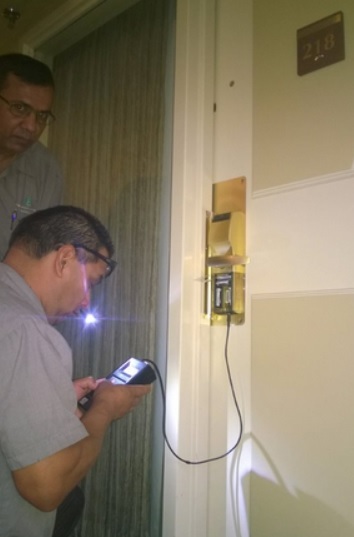 This morning I was stuck outside a hotel room waiting for “engineering” to come and reboot the door. It eventually required a pair of technicians, Luis and Kumar, who jiggled and then replaced batteries (yes, it’s a battery-operated door), then attached two different diagnostic consoles. When they got it working I asked what the problem had been. They had no idea. “Hello, IT, have you tried turning it off and on again?” is the tagline for a civilization whose front-line technicians have no theory of operation. Will the door open when I return tonight? I have no idea. But at least now I know how to turn it off and on again. Author Jon UdellPosted on 17 Jun 2014 17 Jun 2014 Categories . For me personally this is funny and sad. Furthermore, I don’t think they (hotel) understand the full import of who this happened to? Granted you’re just a regular joe, civilian to them. But, I think the whole group of manufacturers who are promoting this stuff should think long and hard about just what it is they DO here.